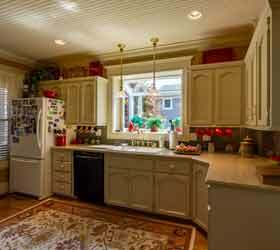 Kitchens are a very important space and often rest at the center of social gatherings and family life. 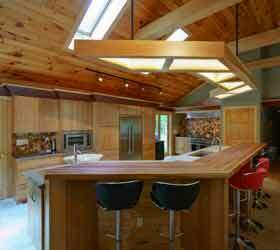 There is a great deal that goes into a successful kitchen remodel; from the intricacies of cabinets, mechanicals and appliances to the considerations of flow, function and material. We believe that as a design & build company our big picture approach and comprehensive experience affords the oversight essential to making these important spaces both beautiful and functional. As a design & build construction company how does our remodeling process work and what are its advantages? In order to answer that question, it helps to first provide some context. In general the typical kitchen remodeling process is often broken down into two separate stages; the design, often by a representative of a kitchen cabinet company, and then the actual installation and construction work by a local builder. While this method works, it’s by no means perfect and it has some limitations. 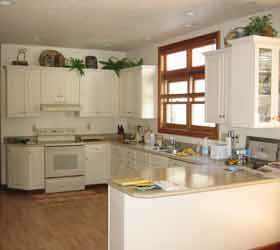 Many kitchen cabinet companies do not charge for kitchen designs with the understanding that they will recover the costs of time spent designing in the markup of the cabinets that they sell. In some ways this works well as it provides the consumer with a risk free way to try out some ideas and get some basic understanding of the material costs involved. But it is a process that has its limitations. In the sense that the design is free, and that people often take advantage of their time, the kitchen cabinet rep has a strong incentive to minimize the time spent designing. This emphasis has a tendency to produce a blindness to any non-standard applications and often limits the scale of the vision to the cabinets themselves and in maximizing their use and sale. The greater context of the lighting, windows, mechanicals and structure are often minimized or ignored. At the same time, local builders often lack the overall time and resources necessary to provide anything other than very basic and standardized design solutions and often seek to avoid responsibility for the overall impact and feel for the spaces they create. In contrast, our design/build process is centered on your individual goals and circumstances and is capable of expanding or contracting to the scale that best fits your overall objectives. Maybe you want your kitchen remodel to be integrated into a living room or dining room space or a new addition, or maybe you want to focus on the dynamics of space and lighting and minimize the overall expense of the cabinets themselves. While we charge for our designs, we feel that the money invested in the design itself allows for the creative exploration of all the options and provides truly customized and personalized results. In addition to our customized design process, we feel that our experience as hands on builders and craftsmen allows for a wider perspective. Having a comprehensive understanding and appreciation for the work facilitates the creation of accurate and realistic timelines and costs estimates. By following the practical and common sense realities of the work, we look to be smart by design and to create the greatest effect for the least expense. 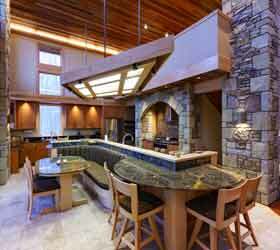 If anything, we feel that the advantages to a design/build kitchen remodel are found in the intention. At its root design/build is a process that demands commitment to the entire process and places emphasis on the overall effect/result as opposed to only a single step. 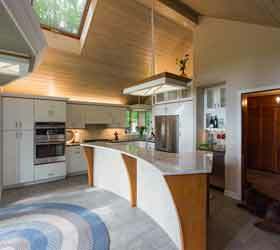 While we realize that this approach isn’t suited to every situation, if you’re looking for a new kitchen that uniquely meets the specific circumstances of your home or situation and seeks to create the greatest long term value in a highly personal/creative sense; we believe that our design/build approach is ideal. 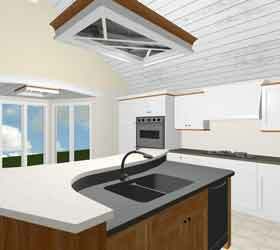 The first stage of a kitchen remodel is typically to meet with you and go over the details of your project in depth. We want to understand your goals and interests, we want to walk through the space and get a sense of its limitations and it’s potential. Based on our initial meeting and if we both feel like we’re a good fit for each other, we’ll craft an initial proposal that breaks out an initial estimate for the design and a budget for the construction work itself. Our initial consultation and proposal is free of charge. From there, our kitchen design process begins with taking detailed measurements of your existing space. 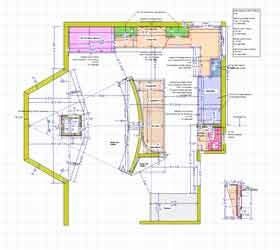 These measurements are then entered into CAD software and a very accurate three dimensional model of the space is created. This model conveys not only the two dimensional blueprint and floor plan, but provides a detailed impression of how the space actually looks and feels. Also, this initial plan and model can be as extensive as necessary and is capable of expanding beyond the kitchen and cabinets to include an addition and/or the entire home. Using the details generated in this initial concept and model, a realistic construction budget is then created. As the process continues to unfold, we’ll continue to adapt and revise both the design and/or budget until you are satisfied with the result. Often, the design process is very much a continual refinement as we work through and experiment with different ideas and competing forces until we arrive at an ideal balance. After a design and budget has been formalized and agreed upon, the necessary permits are obtained and the remodel itself is scheduled. We charge for our design time based on an hourly rate. 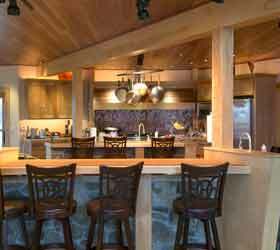 Generally we find that cost of most initial kitchen designs hover around $1,000. 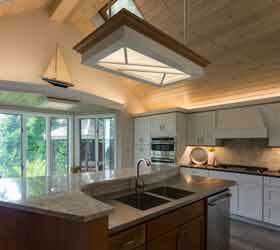 In the kitchen remodel itself, construction costs can vary widely depending on the details. The design process is definitely one of refinement; of working from the general to the specific. In order to know what things cost in detail, you have to know what it is you’re building in detail. As the design progresses, the budget projections become increasingly accurate.